We are the chapter of Deep Green Resistance covering the Seattle area, as well as Renton, Kent, Shoreline, Lynnwood, Federal Way, Tacoma, Everett, Bainbridge, Vashon, Bremerton, the Eastside, Kirkland, Bellevue, Issaquah, and all surrounding regions. This is occupied land of the Duwamish, Suquamish, Muckleshoot, Snoqualmie, Tulalip, and Puyallup nations. 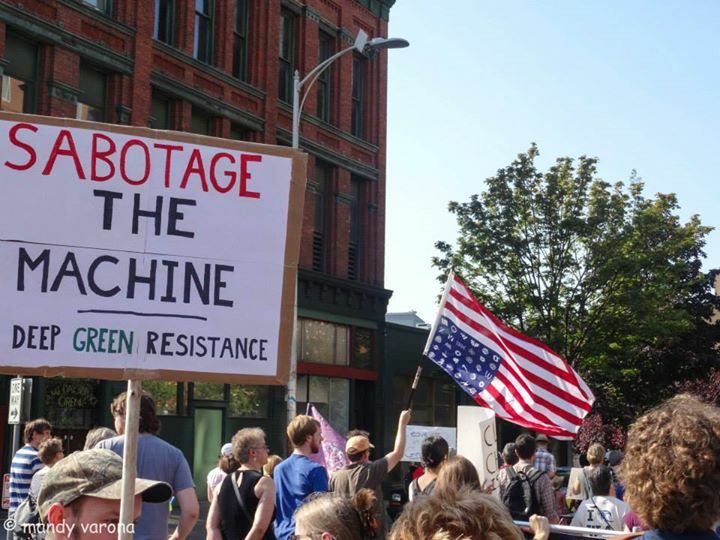 Deep Green Resistance Seattle is about stopping the destruction of the planet. We work to stand in solidarity with oppressed communities. If you’re interested in joining our collective, participating in our organizing work, or supporting in any other ways, get in touch. For ongoing news, check out our blog. Seattle has a long history of social struggle and revolutionary politics that spans many decades. The indigenous people resisted European colonization in several wars in the 1800′s, including the Puget Sound War. Labor struggles have been a huge part of the history of this city, as have been immigration issues, especially in Chinese, Japanese, and other Asian communities. In the 1960′s and 70′s, the second strongest chapter of the Black Panther Party — after Oakland — was built here. Our goal is to build a strong chapter of Deep Green Resistance here in Seattle. This will help us contribute to the broader movement against industrial civilization, and for the planet. We need warriors, healers, communicators, supporters. We need you. Contact us to get involved in DGR Seattle, or to learn more about our work. So while DGR is about fighting back, in the end this organization is about love. The songbirds and the salmon need your heart, no matter how weary, because even a broken heart is still made of love. They need your heart because they are disappearing, slipping into that longest night of extinction, and the resistance is nowhere in sight. We will have to build that resistance from whatever comes to hand: whispers and prayers, history and dreams, from our bravest words and braver actions. It will be hard, there will be a cost, and in too many implacable dawns it will seem impossible. But we will have to do it anyway. So gather your heart and join with every living being. With love as our First Cause, how can we fail? Contact us to join the Deep Green Resistance movement today. Richard, we’d recommend reaching out to your local chapter of the National Lawyers Guild (NLG) or other left-wing lawyers groups for advice on these issues.